On 11 June 2018, London’s Information Rights Tribunal ruled that the police cannot refrain from providing information to the Network for Police Monitoring (Netpol) on how often anti-fracking activists are referred to a secretive "de-radicalisation" programme based on national security reasons. Netpol brought the case to court after the Information Commissioner supported five police forces who rejected the requests for information about "Channel", a deradicalisation programme which part of the UK government's controversial Prevent strategy. Prevent is a referral system for people identified as “vulnerable to being drawn into terrorism”. Netpol reported that the police tendency to disregard the request for transparency on national security grounds “is a long-standing concern for many campaigners alarmed about the scale of intrusive surveillance on political dissent”. Leaked documents had exposed how "the security services and police have been using Prevent to monitor not just Muslim activism and charitable work, but dissent and "subversive activities" that go well beyond ideologies that “draw people into terrorism” including anti-war, anti-fracking, pro-Palestinian, anti-austerity, animal rights campaigns. Reclaim the Power (a direct action network fighting for social, environmental and economic justice) is organising the Break the Chain 2018 campaign which is targetted at the fracking industry and its supporters. 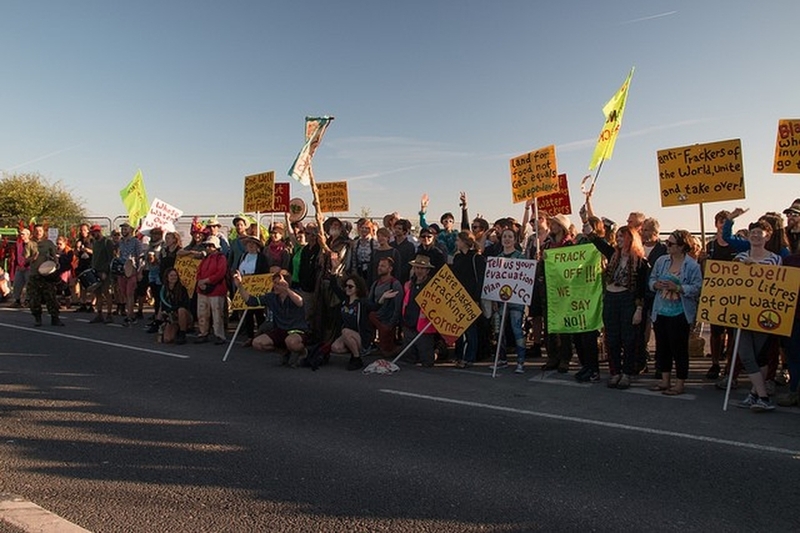 The campaign began on 12th June and ended with Block around the Clock, during which a small group of demonstrators blocked the entrance to Cuadrilla's Preston New Road fracking site in Lancashire for 54 hours. The demonstration blocked all truck deliveries to the site during this period. She went on to outline the movement's intention to continue challenging any individual or organisation facilitating the fracking industry in the UK. “When Theresa May launched this public inquiry we all hoped that the truth about this scandal would finally be exposed and that the disgraceful police tactics would be examined. Instead, the public inquiry Chair is making the inquiry more secretive and is granting the police anonymity in secret hearings. It is time the Home Secretary listened to the victims and appointed a diverse panel to hear the full evidence." "We are delighted that the Met has seen common sense and will not be targeting Notting Hill Carnival with facial recognition again this year. However, we are troubled by the force's plans to dramatically increase use of facial recognition over the next six months." Press freedom groups welcomed news that amendments to the Data Protection Bill passed in May, with potentially adverse effects on press freedom would likely not go through. The proposed amendments were similar to Section 40 of the Crime and Courts Act 2013, a development previously reported on the CIVICUS Monitor, where newspapers not registered with the state-backed regulator Impress would have been responsible for the payment of costs on both sides in any privacy disputes.